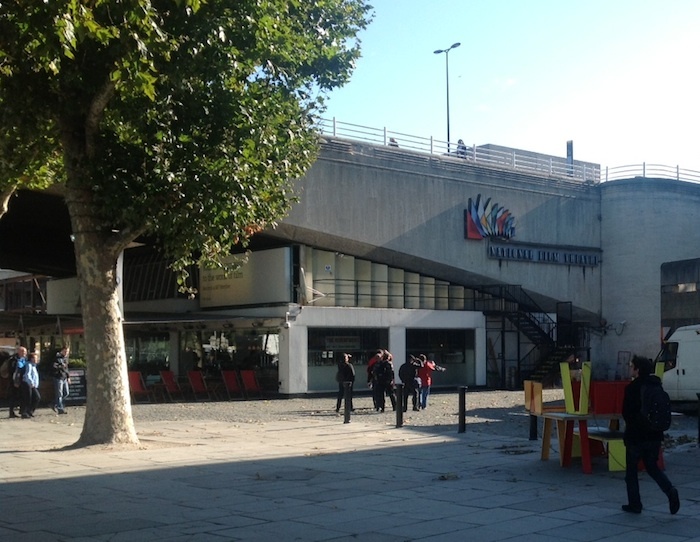 BFI Southbank, as seen from the river and nestled beneath Waterloo Bridge. The riverside bar is on the left and on the side of the building is the old nameplate of the ‘National Film Theatre’. I enjoyed my three day visit to the LFF and this time to have the chance to spend more time in ‘BFI Southbank’ as it is now branded. I know that the changes took place some time ago, but for those of who live 200 miles or more away, the LFF is our main chance to experience it. I failed to enquire why I couldn’t get a Wifi connection, so that’s my fault. On the positive side, I did spend time in the BFI Library, although only as a reading room, so I can’t comment on how efficient it was in getting books from stacks. But it’s free and I didn’t need to book and I appreciate that (I am a BFI member, but at Stephen Street you had to book and pay if I remember rightly – I most used the library back in the 1980s in Charing Cross Road). In the evening, the library space became a venue for talks etc. I didn’t visit the Mediathèque, which was closed on one of the days, but it’s clearly a useful resource (you can watch a wide range of BFI holdings on-line). Perhaps what I appreciated most was that the whole building is now more open and airy. The bar-restaurant overlooking the river seems to work much better than I remember previous arrangements and it was a pleasure to have a late breakfast there before a late morning screening. London has a problem as a film festival. Its timing places it after all the major European festivals (Berlin, Cannes, Karlovy Vary, Venice, San Sebastián etc.). It finds itself with only a handful of major films that offer a European première or a ‘world première’ (Toronto has already taken most major films). And now London is competing with Rome (now scheduled for November) for what is left. London was once a festival for UK cinephiles, allowing them to catch up with all the art films that had appeared at other festivals. It was relatively small and inward-looking. It has gradually grown and recently has reached out to a wider, non-specialised audience as well as attempting to attract industry delegates, partly through promoting its three competitions. But as industry commentators have pointed out, if LFF wants to raise its profile further (and in industry terms the UK rivals France as a film production/distribution centre) the BFI would need to throw a lot more money at the festival to secure more prestigious premieres and guests. At the moment, winning best film in London is not a big deal. This year, the winner was Rust & Bone, Jacques Audiard’s big breakthrough film after several arthouse triumphs. The film didn’t ‘need’ the London win, but perhaps it will help the film in the UK where it opens next week? In France, its biggest market, it opened back in May soon after its positive reception at Cannes. London opened with Tim Burton’s Frankenweenie (in UK cinemas a few days later) and closed with Mike Newell’s Great Expectations (in UK cinemas in December). These films fulfilled the red carpet requirements but do either of them belong in a major film festival? LFF 2012 has been a commercial success for new director Clare Stewart with more bums on seats in more venues over a more concentrated period. I have no complaints about that and if promotion of cinemagoing to a wider public is the aim, all well and good. But is it compatible with raising the industry profile of the festival? Compare London to Toronto – no ‘official competitions’, only a ‘audience award’ but real evidence that the festival can launch small films on their way – Juno, Slumdog Millionaire are perhaps the best examples. Can LFF do that? Does it want to? My final film during my festival visit was programmed in the ‘Debate’ strand, though again, I fail to see what the debate might be – except that we might want to argue that most of us who live comfortable lives ought to appreciate much more how difficult other lives can be. But that can’t really be contested, can it? Children of Sarajevo is a dark film but the strong performances, especially by Marija Pikic as the central character Rahima, make up for that and give us a sense of hope. Produced with support from production companies and funding agencies in France, Germany and Turkey, Children of Sarajevo still ranks as a relatively low budget film and most of the action takes place indoors or on local streets at night. Rahima is introduced as a young woman wearing a headscarf and from the inserts of video footage of the war in Sarajevo in the 1990s, we deduce that she survived the war (but lost her parents) and has turned to her faith in an attempt to make sense of her life. Rahima has problems. She is the only breadwinner in her household and works hard as a chef in a large restaurant. She returns home to housework and the latest calamity to befall her young brother Nedim, still at school. The neo-realist narrative driver in this film is a broken iPhone – belonging to the son of a local wealthy politician, but broken, allegedly, by Nedim in an attack on the boy. We don’t know exactly what is in Rahima’s background, but she is treated badly by the school headteacher and by the corrupt politician, both of whom expect her to pay for a new iPhone. Nedim doesn’t appear to be a ‘bad lad’, just not very aware of everything his sister has to do for him and he starts to make the wrong decisions about getting involved in local criminality. On the other hand, Rahima is very much part of a community, with a potential suitor and close supporters in her housing block. I’m not really sure that I appreciated the significance of the hajib she wears. (I live in an area where muslim women wear all kinds of combinations of veils and scarves.) Rahima is the only one of the women in the film to do this and she clearly has female muslim friends. I found a review of the film written after its successful Cannes screening (the Jury Prize in the Un Certain Regard competition) that discusses this issue and quotes the film’s writer-director, Aida Begic (who is also photographed wearing a headscarf). The East European Film Bulletin review by Collete de Castro suggests that: “In wearing the veil, Rahima is at once closer to God and further away. Hiding from the world, she is at once protected and exposed.” The director is quoted as saying that the idea for the film came to her when she realised that “we don’t believe in the reconstruction of our society any more, we’ve replaced dreams with memories”. That makes sense. The world she depicts in the film is no longer at war as such, but it certainly isn’t a world that is at peace with itself and there appear to be great inequalities. The young women recruited by ‘Autonit’ listen to the manager explaining the work. Arati (Madhabi Mukherjee) is 2nd from the left and Edith (Vicky Redwood) is on the far right. It’s great news that Satyajit Ray’s 1963 masterpiece is to be re-released in the UK on a new digital print in Summer 2013 and it was a privilege to be able to view the new print in the ‘Treasures’ strand of the LFF. This restoration goes back to the original film negative and looks very good. The only slight disappointment is that this isn’t one of Ray’s more location-based films. The title translates from Bengali as ‘The Big City’, but much of the film uses sets and back projection. No matter, all the other ingredients are there: a beautifully written story, fantastic performances and a riveting theme of tradition, women’s freedom outside the home and the economic realities of modern Calcutta in the 1950s. At various points, calendars and diaries tell us that it is 1953. Because we see little of the city, the only other contradictory signifier of time period is a rather more modern motor vehicle that looks early 1960s. The time period matters perhaps only in respect of one of the narrative strands concerning the Anglo-Indian community in the city – see below. The story by Narendranath Mitra focuses on the Mazumdars, a single family of three generations. Subrata and Arati live with his parents and their own child plus Subrata’s younger sister – still a young teenager. Money is becoming scarce for this middle-class family. Subrata works as an accountant, but his salary is barely enough to support the extended family group and he feels ashamed that his father, a retired teacher with an MA, is reduced to seeking favours from his ex-students who have ‘made good’ (this is one of the separate narrative threads in the film as the old teacher visits his students). When Arati suggests that she might get a job, her husband at first refuses (and doesn’t tell his father) but the prospect of a second salary is far too tempting in the economic circumstances. Arati applies for a job and after an interview is appointed as a ‘salesgirl’ or ‘canvasser’, making housecalls in order to interest upper middle-class housewives in the purchase of a knitting machine. Her immediate boss is a successful Bengali manager. Presumably the machine itself is imported or made in India under licence. I’m not sure why I think this, but I suspect that Ray used his own experience of advertising agencies in London to design the company logo. This film isn’t about industry as such (that becomes the focus of Company Limited in 1971) but the Bengali manager makes several comments about being free of foreign control. The film works mainly because of the riveting performance by Madhabi Mukherjee as Arati. She was only 20 when she worked on the film, but convinces as a married woman a few years older. The film narrative depends on her believable transformation into a working woman who can stand up for herself. The ‘Anglo-Indian question’ is significant with the film set in the early 1950s, only a few years after independence. One of the other four young women appointed as canvassers at the same time as Arati is Edith, an Anglo-Indian in her early twenties about to get married and needing the income. The Anglo-Indians (defined here as mixed race families, rather than as Europeans who remained in India after independence) faced a difficult position when the British Raj ended. Many sought a new life in the UK, Canada or Australia. Those who remained, mainly in Calcutta or Madras, could no longer rely on the more prestigious jobs in railway administration. Edith is depicted as a modern young woman in Western clothes who speaks English in all situations. She befriends Arati, who is open to new experiences, and this friendship is central to the narrative, both in the influence of Edith on Arati and in the conflict created by the behaviour of the women’s boss who demonstrates his prejudice towards the Anglo-Indian community and Edith in particular. The manager is quite an unpleasant character and several commentators have linked this attack by Ray on the ‘new business types’ in the city to his similar criticisms of older business leaders in his previous film Kanchenjunga. Despite the prejudice shown by the manager and some rather ungracious behaviour by one of the old teacher’s students, overall Ray sticks to the rule of his mentor Jean Renoir and characters are presented as ‘human’ in their behaviour. This is especially true within the family situation. Subrata has the education but he is not as bright as his wife. He is bound by tradition, but he loves his family. The ending of the film has been criticised by some as too optimistic – in a film about the economic realities of life in the city. But really it is optimistic about the marriage. I guess I’m an old romantic, but I thought that there were grounds for optimism. Often rated slightly less highly than Ray’s most famous films, Mahanagar is for me right up there amongst the best. Writer-director Nishikawa Miwa was in attendance for this screening and through the excellent interpreter, whose name I didn’t catch, she was able to give the audience plenty to think about. It’s quite a long film (134 mins) and we didn’t leave NFT2 until around a quarter to midnight. I enjoyed every minute. Dreams for Sale is a fascinating comedy-drama with two excellent lead performances by Matsu Takako (the teacher in Confessions) as Satako and Abe Sadawo as Kanya– Mr and Mrs Ichizawa, the central couple. At the beginning of the narrative, a fire in their restaurant as Kanya is preparing food destroys their investment and shakes their confidence. Satako recovers quite quickly and goes to work in a noodle bar but Kanya, the chef, is hit badly and starts to drink. However, a chance encounter with a woman he knows provides access to a new sum of money. At this point, we realise that we’ve seen this woman before in a sequence which seemed inconsequential at the time. This is a strategy Nishikawa develops through the film. The audience needs to stay awake to remember everything they have seen and link scenes together. Satako is at first upset that her husband has got something from another woman, but then she starts to recognise that her husband, though not conventionally handsome, has a charm that seems to attract vulnerable women and she begins to work out how to use this quality to ensnare women with access to money. The couple will eventually become an adept pair of ‘marriage fraudsters’. Posing as his sister, Satako finds women and prepares the way for Kanya to seduce them into ‘pledging’ money for marriage – or simply because they will do anything for him. Nishikawa Miwa told us that she had researched marriage fraud in Japan and that it was a significant issue. The obvious course would have been to make the film a crime story – how will they be found out, what will happen to them? There are also comic elements to exploit in the suspense as the stories of deception become more difficult to set up and control and we imagine all the duped women turning up at the same time. Indeed, some reviewers see the film as a very controlled farce. However, though there are elements of both crime film and comedy, Nishikawa plays it much more like humanist drama. What she really wants to do is to explore love and marriage – what does the deception do to the couple, what do they find out about themselves? They are not ‘bad people’ and most of the women they defraud have money to spend and they are getting something from the deal. Satako and Kanya also want to spend the money on a new venture, telling themselves that they will pay everything back. This doesn’t make the crime acceptable, but it does point us towards thinking about the current state of society in Japan and in a way the film fits in with the long-running series of stories about unemployment amongst skilled workers in the face of a stagnant economy. In some ways the film attempts something similar to Villain, the very successful awards winner in Japan that failed to find audiences in the UK. I think Dreams for Sale is probably a better offering for UK audiences. This is a very good film that reveals its many qualities gradually and makes some demands on audiences who are repaid handsomely in the way in which the narrative develops. I hope it gets wide distribution and I recommend it highly if you get chance to see it. ‘Here’ is the mountain region of Guerrero in Southern Mexico (inland from the Pacific Coast around Acapulco). 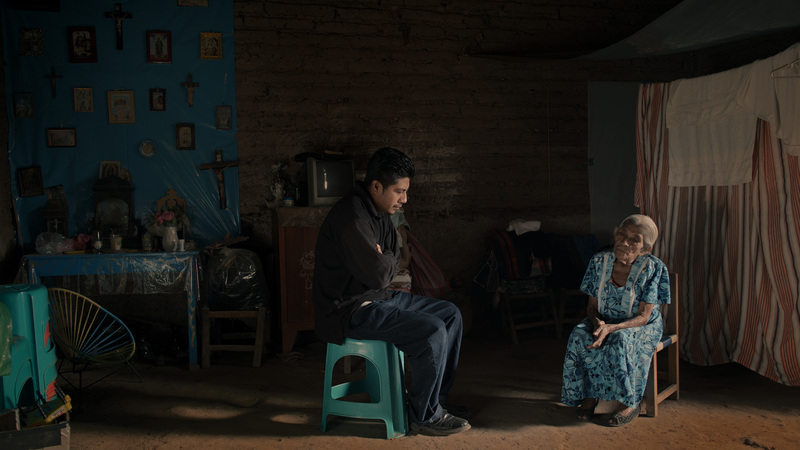 This Mexican feature, like the earlier LFF film Memories Look at Me, is placed somewhere between fiction and documentary. It’s a deceptive neo-realist story that forgoes a strong central narrative in order to present events in the life of a Mexican family in separate episodes over a few years. In the section titled ‘The Return’ at the beginning of the film, Pedro, a would-be dance band musician returns from his latest trip ‘over there’ (i.e. to New York) bringing with him an electric piano he’s bought in the hope of starting a new band. He’s welcomed back by his wife and two young daughters, the older one, Lorena already a rather moody adolescent. In the next few months Pedro finds that earning money from the band will not be easy. He works in the fields picking corn cobs and later on building sites, but it is hard to make progress. 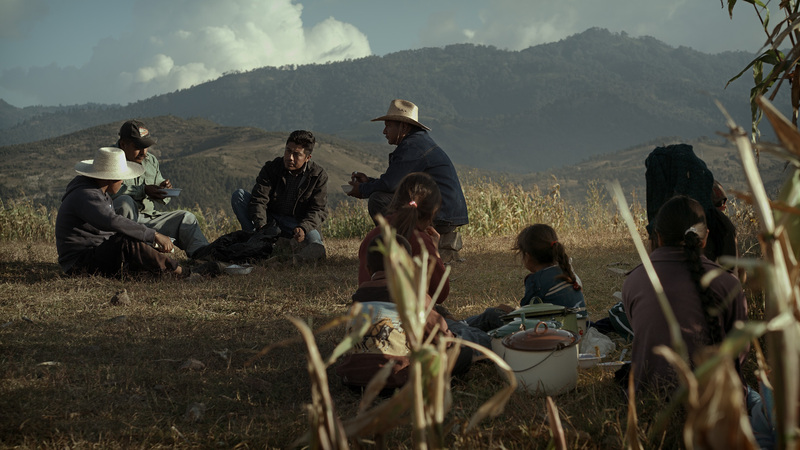 The film’s setting is the province of Guerrero, specifically Copanatoyac, a small town in the mountains. The presentation is calm and slow-paced. Individual shots are often held in beautiful long shot compositions for 30 seconds or more. On the other hand, there is plenty of diegetic music (all written and performed by the musician Pedro De los Santos, playing himself) with rehearsals and impromptu performances. There is a strong sense of place and we get to know the characters well. 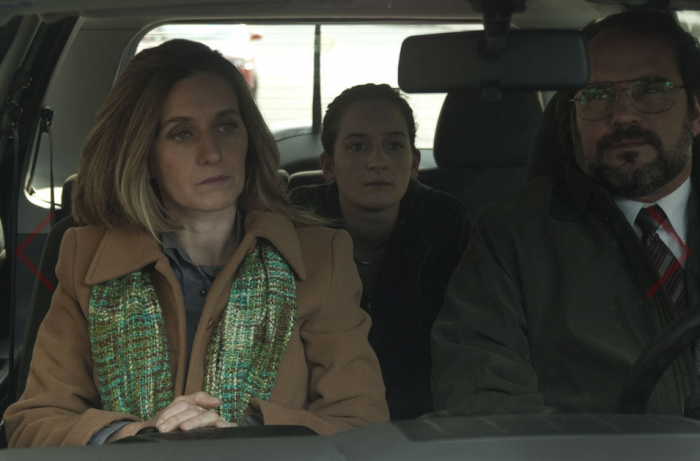 There are moments when it looks as if the film might move into realist melodrama – especially when Teresa, Pedro’s wife, has a problem pregnancy and Pedro must find money for drugs and for blood transfusions in the hospital of the nearest major town. At this point, I was concerned that Pedro, in desperation, would turn to stealing the money as the hospital offered to accept money instead of blood. But seemingly deliberately, the director withdraws from the possibility of dramatic scenes and this particular crisis is averted. By underplaying these scenes, writer-director Antonio Méndez Esparza allows the overall narrative effect to perhaps be stronger. He was brought up in Madrid and trained in New York, having also lived in Mexico according to his bio in the beautifully-produced Press Pack on the official website. It has taken him five years to realise this project in which Pedro and Teresa play versions of themselves. The whole cast is non-professional but the film is very well put together. It’s a hard life in the hills and there are many problems to be overcome with stoicism and the occasional dance. One scene typifies the philosophical position of an elderly woman who announces that when she dies she doesn’t want to be carried in her coffin in a procession to church. She doesn’t want a fuss – she has already been to Mass and she wants to go straight to her grave. Here and There received support from the Sundance Festival and it screened at Cannes in the Critics’ Week strand. It has been highly praised by critics but I have seen some reviews which clearly don’t appreciate the power of quiet, contemplative cinema. I agree with the consensus which recognises that the unique approach of the film in tackling the other side of the migration issue – what happens to the people and communities left behind? They suffer in different ways – children who don’t see their fathers, young women who lose their boyfriends, wives their husbands, friends their social contacts. I was disturbed to read that Guerrero is now the Mexican province with the highest murder rate (presumably around Acapulco) but just as tragic is the slow death of communities from loss of migrants to ‘over there’. Aquí y Allá deserves to be distributed widely. Tsumabuki Satoshi as Makoto Taiga, posed with the girls from the ‘trade school’. Is Takashi Miike the hardest-working man in showbizz? He certainly completes a mind-boggling number of films each year. Very few of them get a cinema screening in the UK, so I was delighted to get the chance to see this in NFT 1, albeit on a French print with burned-in French subs and an extra English subtitle above. For Love’s Sake (aka The Legend of Love & Sincerity) is a live action adaptation of a manga, although it begins and ends with short anime sequences. (It’s a Kadokawa film from a Kodansha manga – i.e. the Kadokawa parent – but produced for the Toei Studio) That’s the simple part of its definition – placing it generically is more difficult. The central character is Makoto, at 18 a rebellious and violent young man, full of aggression. We meet him on the streets of Tokyo, taking on a whole gang of wild youths single-handed. Surprised by the appearance of Ai, a wealthy and very poised young woman, Makoto allows himself to be taken by the riot police. Ai then determines to use her father’s money and influence to spring Makoto from prison and get him admitted to her exclusive prep school. We know from the anime prologue that Makoto saved Ai’s life eleven years previously when he swore her to secrecy because he didn’t want it known that he’d helped a rich girl. She now recognises him (from the scar on his forehead), but he wants nothing to do with her. The other point to make here is that the time period is supposedly 1972. Since a) most of what follows takes place on highly stylised sets and b) Japanese school uniforms and the outfits of street gangs are more or less timeless, I forget about the time period for the rest of the film. Perhaps the best way to describe the genre repertoires is Grease-style high-school musical meets Buffy the Vampire-Slayer (but without any supernatural stuff) and a yakuza comedy. Various other Japanese generic characters wander in at various points and the whole is extremely enjoyable. The sets really are wonderful and reminded me a little of Suzuki Seijun films from the 1960s such as Gate of Flesh. Several sequences require characters to burst into songs. I know very little about Japanese pop music but they were easy to listen to and the performers were excellent. The major point about Miike is usually the violence and there is plenty of it here, mostly enormous fistfights and kickings. In this film the female gangs are just as vicious as the male and Makoto fights both with equal gusto. I’m not sure if this suggests sexual equality but once you become inured to the violence through constant repetition, it ceases to be violence at all really – more like a form of aggressive dance choreography. (I wonder if Miike has ever seen the British ‘St Trinian’s girls in films – schoolgirls with hockey sticks instead of baseball bats?) The plot requires Makoto to get involved (against his will) with two other young women and Ai has her own unwanted suitor in the form of a geeky character who reminded me of a less quirky/comical Richard Aoyade (Moss in The IT Crowd on UK TV). In the end we discover the real reason for Makoto’s aggression. Makoto is played by Tsumabuki Satoshi, who I later realised had played the lead in Villain (2010). At 31 he is considerably older than the teenage Takei Emi who plays Ai.Wikipedia reveals that the original manga by Kajiwara Ikki was published in 1973 and was followed quickly by an audio (radio?) version, a TV adaptation and three live action film versions, all produced in the 1970s, which explains the setting. I can’t really think of a better recommendation than to suggest that the film is constantly entertaining throughout its 130 mins running time. I assume that it will become available on DVD, but if you get the chance, see it on the biggest screen possible in order to appreciate the sets and the ‘Scope compositions from Miike’s current cinematographer Kita Nobuyasu. By the time of my third film of the day, I was very tired and this was a demanding film in the circumstances. This interesting review from Cine-Vue suggests that the film was well-chosen as part of the ‘Debate’ strand of the festival (a slide on-screen announces this after you’ve sat through the rather tedious festival filmed introduction sequence of a young woman watching films and stuffing herself with popcorn). I’m not sure that simply giving us ‘Debate’ – almost as a command – works for me, but having an Algerian filmmaker or critic present to introduce the film would have been good. LFF is actually quite good at this kind of thing. Merzak Allouache is a veteran Algerian director (born in 1944) and I remember with pleasure his 1996 film Salut Cousin! about a North African visitor’s sometimes comic adventures in Paris while staying with his cousin. This new film is very different. A statement during the credits tells us that a ‘Repentant’ is the official term used by the Algerian authorities for ex-soldiers from the Islamist guerrilla groups who fought in the Algerian Civil War and who were prepared to come down from the mountains and forests, hand in their weapons and report to the police before resuming ‘normal’ life. One such is Rachid, whose appearance at the beginning of the film in his parent’s village creates a local stir with some villagers attacking him as the only available possible murderer of their family members. I didn’t pick up the precise time period for the action in the film but historically the story would fit in the period around 1999-2000 following the passing of legislation about ‘civil concord’. Rachid reports to the police in the neighbouring town. He is offered a job in a café-bar arranged via the police and expected to start naming names. But when he discovers the identity of the local pharmacist, he feels compelled to act without telling the police. I won’t spoil the narrative. Suffice to say, we don’t know at first why the pharmacist is so important or where the story is going to go. Narrative information is given to us sparingly and there is a palpable sense of unease. The film is quite short (87 mins) and it ends rather abruptly. I think I agree with the Cine-Vue reviewer that some of the characters such as the (very reluctant) café owner and the local police chief who set up Rachid in his new identity need more time on screen. The film was another to be screened in Cannes in Directors Fortnight and it was given a prize by Europa Cinema distributors. I hope it does get a wide release but I think, unfortunately, that it will be a hard sell in the international market. All the more reason then to be grateful to the LFF for bringing it over. Uruguay is the richest country in South America, but it also has the smallest population. No surprise then that this film is a co-production. For a country with such a small population (under 4 million), Uruguay produces some major talents in football and cinema and this film is a worthy addition to the national output. I thought at first that this was going to be a drama. I was surprised by the ending but on reflection it all makes sense. Perhaps a ‘comedy family melodrama’ is the best description? Director and co–writer, Pablo Stoll, has previously made dry comedies such as the international hit Whisky (2004) with collaborator Juan Pablo Rebella. 3 is his second solo film and it was screened in the Directors Fortnight at Cannes in 2012. Rodolfo and Graciela are divorced. Rodolfo is in a second marriage, but that too is failing and his contact with his teenage daughter Ana remains important and brings him back to Graciela’s apartment, now sadly neglected. Rodolfo is a roly-poly dentist with an obsession for order, a love for his collection of houseplants and a passion for football which he still plays quite well, despite his weight. As one marriage deteriorates he finds himself increasingly trying to patch up his old one — literally in terms of falling plaster and damp on the walls and, in human terms, with his daughter. Graciela is introduced as a harassed mother and single woman who nightly visits the hospital where her spinster aunt is gravely ill. At the hospital she meets a younger man who is similarly visiting as a ‘carer’. The two hospital patients are never seen, joining Rodolfo’s second wife, whose recent presence is signalled by ashtrays full of cigarette butts (everyone smokes with a passion), as unseen but narratively important characters. Ana is a typical adolescent, first introduced as the bright girl being cautioned by a tutor because her lateness and frequent truancy are likely to see her repeating the year. She is also sporty, playing on the school handball team and taking after her father in a way. Ana discovers boys, alcohol and other means of spending her time. She is well-played by Anaclara Ferreyra Palfy, who at 20 manages to look 15 most of the time – although the traditional school uniform doesn’t help. She also bears some resemblance to Sara Bassio as her mother, so the casting works well. 3 has excellent music, some good laughs, terrific performances and overall offers decent entertainment. It should do well on the international market, though at 115 mins it is perhaps a tad too long. If I was being hyper-critical, I’d suggest that the narrative favours Rodolfo just a little too much. I liked him as a character but I’d have liked to know more about Graciela. There is a useful ‘official website‘ (in Spanish and English). #GFF19 35mm All in the Family art cinema Arthouse Berlinale BIFF 2012 BIFF 2013 BIFF 2014 biopic Black British film Bradford International Film Festival Chilean cinema crime fiction crime film crime melodrama crime thriller Cuba Cuban cinema Douglas Sirk Ealing Studios Egyptian Film family comedy family drama family melodrama fantasy Film Noir Films From the South GFF16 GFF18 Glasgow FF15 Hebden Bridge Picture House historical drama home front drama Hong Kong cinema Hyde Park Picture House Indian Parallel Cinema Israeli Cinema Ken Loach Kurosawa Akira Leeds International Film Festival lesbian film LFF30 LFF 2012 LFF 2015 LFF2016 LIFF 2018 long-form narrative Melodrama migration neo-realism New Wave Nouvelle vague Patricia Highsmith polar political cinema political thriller psychological thriller Realism road movie Romance romcom satire Satyajit Ray science fiction Second World War social realism Spike Lee thriller war film war movie Western genre youth picture Zhang Yimou ¡Viva!